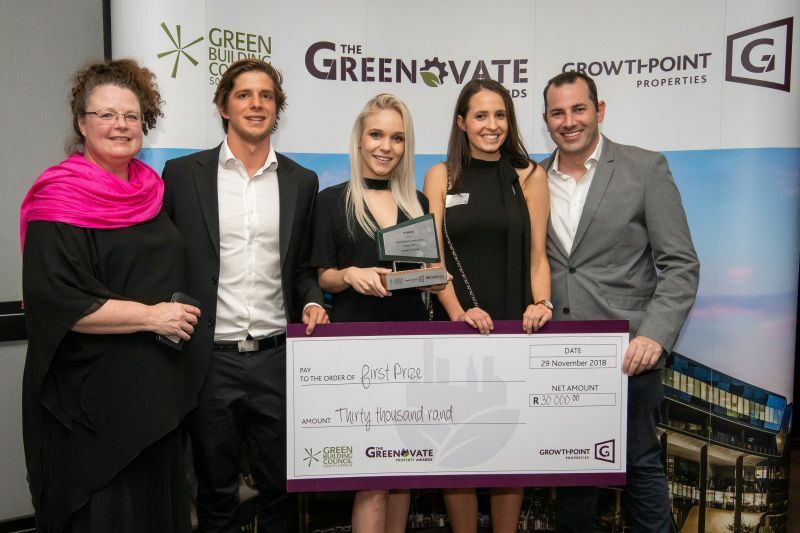 An app that assesses the relationship between green buildings and their occupants’ behaviour, and a greywater treatment and reuse vanity system for handwashing water, were the two pioneering submissions that won top honours at the Greenovate Property and Engineering Awards 2018. The University of Cape Town (UCT) team of Michael Inskip, Samantha Johnson and Morgan Knowles, supervised by Saul Nurick and Karen le Jeune, with their submission titled “Assessing the relationship between green buildings and their occupants’ green citizenship”, won R30 000 for their first place in the property stream of the awards. Another UCT student, Chloe Bolton, supervised by Dr Dyllon Randall, with the submission titled “Greywater treatment and reuse: Wetland microbial fuel cell and sand filtration system for the on-site treatment and recycling of handwashing greywater”, also took home R30 000 for her first place in the engineering stream. Both winners also earned the opportunity to present at GBCSA Conference 2019, local flights and accommodation included. This is the second year in a row that UCT has taken top honours in both awards. Karen le Jeune, UCT supervisor, with Greenovate 2018 Property Award winners Michael Inskip, Morgan Knowles and Samantha Johnson, and Saul Nurick, UCT supervisor. The Greenovate Awards is a joint venture initiative between Growthpoint Properties and the Green Building Council of South Africa (GBCSA), launched in 2015. This student programme aims to educate and reward the young minds and future leaders of South Africa for innovation and green building in the built environment. The programme has two streams: The Greenovate Property Awards, offered for the fourth time in 2018, and the Greenovate Engineering Awards, now in its second year. A total of eight universities competed this year. The second place in the property stream was claimed by the University of the Witwatersrand (Wits) team, made up of Rashid Bulbulia, Onneile Mfetane and Hitekani Mongwe, with their submission titled “Incorporating cow dung in modern acoustics”. Stuart Ray supervised the team. The third place went to another Wits group: Kimera Ramruthan, Ziev Shani and Justin Watkins, supervised by Prisca Simbanegavi, with their submission titled “Investigating the possibility of making rental housing in the gap market more affordable through green building technology”. In the engineering stream, North-West University (NWU) student Eben Schutte took second place with the submission “Investigating the suitability of electromagnetic water flow meters in a residential context”, supervised by Dr Henri Marais and Dr Leenta Grobler. The Stellenbosch University (SU) team of Marchant van den Heever and Frederick Albrecht Bester, supervised by Prof GPAG van Zijl, was in the third place with their “3D-printed concrete” submission. 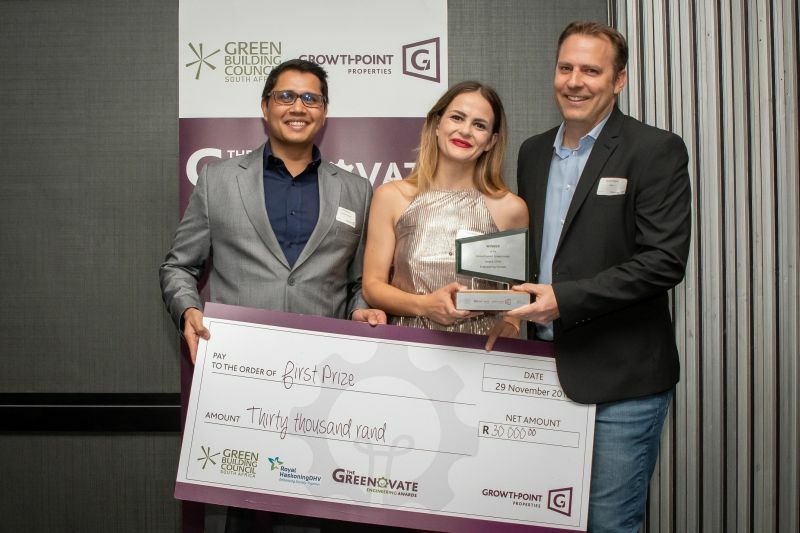 Mitesh Bhawan, head of sustainability and utilities at Growthpoint Properties, Chloe Bolton, Greenovate 2018 Engineering Award winner, and Manfred Braune, GBCSA executive director and managing executive for sector development and transformation. Changing the built environment for the better, the innovative idea for an on-site nutrient recovery urinal by the winner of the Greenovate Engineering Award in 2017, Craig Peter Flanagan, who represented UCT, has been implemented by Growthpoint at its new head office development for Exxaro in Pretoria. By incorporating the fertiliser-producing urinal concept into a major commercial office, it has changed Growthpoint’s thinking on how it develops new buildings. This practical example of the benefits of encouraging and enabling green building innovation is another reason why Growthpoint and the GBCSA have set their sights on continuing to grow the competition and programme to include more universities and a broader knowledge base of innovative solutions. For more information on the awards, visit www.growthpoint.co.za.